I went for a feta-less Greek Salad with Blackened Tofu. It was fantastic. 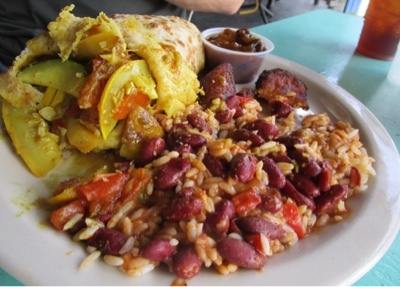 The Mr. had Veggie Roti with Rice and Beans and Plaintains. Also a winner. Service was excellent. We will put this place back in regular rotation and hope some iguanas show up, there were none this visit. 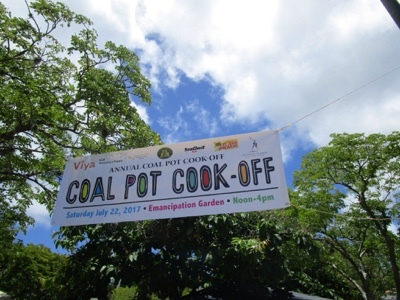 Saturday was the annual Coal Pot Cook-Off. 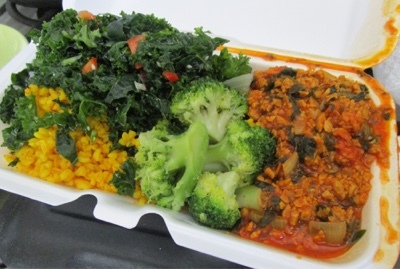 I have missed the past two, and was determined to not miss another..
Carryout from Love Livin on Monday...Bulgur, Kale Salad, Broccoli and Chili. Very nice. 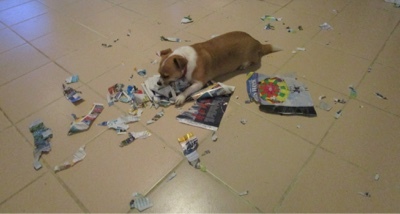 Sweet Sadie decided to destroy my bathroom reading material. She was having such a good time, I didnt want to stop her. Lots more to come. Bye for now. Wow!! Looks like the meals you had were absolutely amazing. 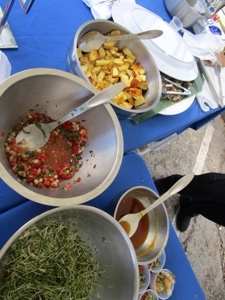 I love the look and sound of the salad and Mr. SV's meal looked really delicious as well. The Love Livin meal looks yummy and definitely like they give you a ton of food! Very bright and vibrant too. I am always pleased when I have good lighting. Still dont know enough about photography to take decent pics without it. 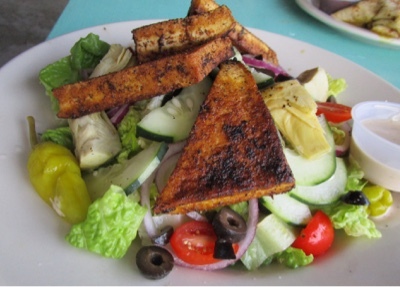 The blackened tofu atop the Greek salad looks amazing! 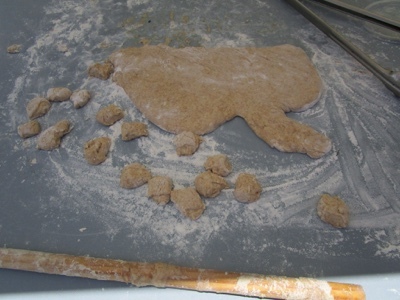 I really should look into how to make it at home. 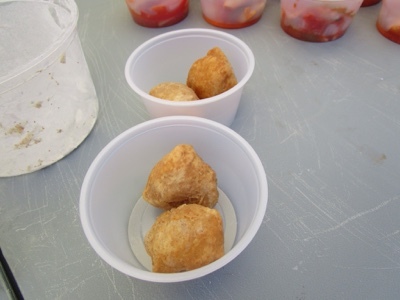 Is the Johnny Cake like a hush puppy or donut hole? It's too bad they didn't have more options for food - especially considering it was two years in the making! I have no clue how restaurants blacken Tofu. Love the stuff. 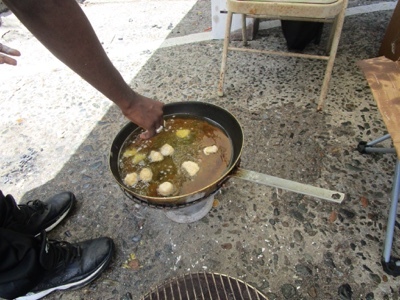 A Johnny Cake is just fried bread, not sweet (unless you get it served with honey). That blackened tofu looks amazing! Sweet Sadie, she does look like she's having a blast!!! Sadie is such an intense little dog. So much personality in such a small being. The tofu greek salad and the Mr's roti meal look SO good! Very exiting that they've upped their game under new owners. 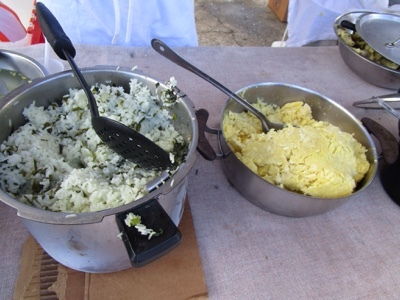 What a disappointment that the cookoff didn't have much! 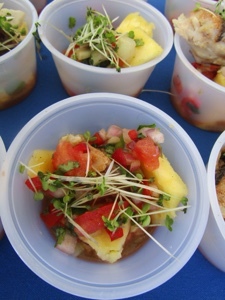 The breadfruit salad looks pretty though. I think your df mavens had melting refreezing problems, my pint was fine and when they had a shop here (for less than a year) it was creamy. I got Nada Moo pistachio this week, which is even better. Vegan Pistachio Ice Cream? One can only dream. Sometimes I suspect some of the food that gets shipped down here are items that has been discontinued on the mainland. Strange things appear on the grocery shelves that remain there till sold out and never get restocked. Another Asia trip coming up?